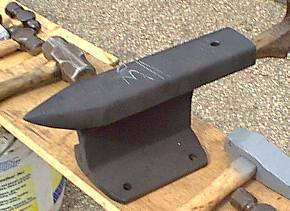 RR-Rail Anvil Photos : Typical shop made rail road rail anvils. Plain Sections cleaned up and painted. Short Horned finished and aged. Beautifully Finished railroad rail anvil. 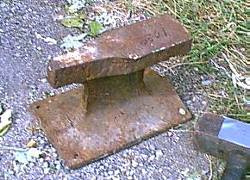 Old railroad rail anvil in "Honest" Bob Cruickshank's collection. Although this is one of the rougher looking RR-rail anvils it has the best general shape. A foot has been left under the horn and it is notched to bolt it down. 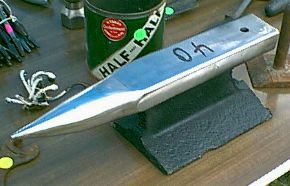 If slabs were welded on to the sides of the web to stiffen it and the horn dressed it would be a fair light duty anvil. 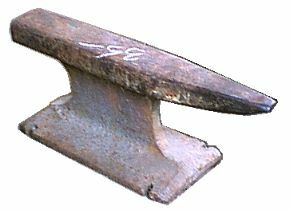 In general RR-rail anvils are too light for most forging. The best for heavier work are the plain cut off sections like the red painted ones above. They are made all over the world, even "down under". 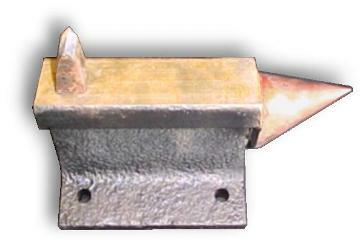 RR-rail anvil with hardie and machined horn. 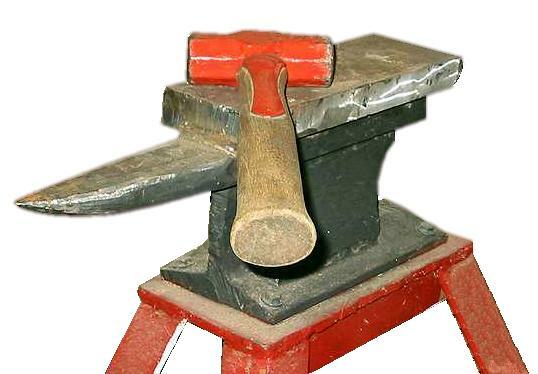 There are a number of folks that spend a lot of time whittling square hardy holes in RR-rail anvils. The welded on horn is unusual. RR-Rail anvil by Scott Grtandstaff. It has Caterpillar ground engagement steel (cutting lip) for its top and side gussets. I was replacing the edge on a big loader bucket and had good stuff from the old one left over. Ground engagement steel is tough stuff that welds well. Notice the strapped hammer? Scott says, I like strapped hammers. Got tired of handles breaking off just below the eye, so I do this to all my striking tools over 2 pounds now.